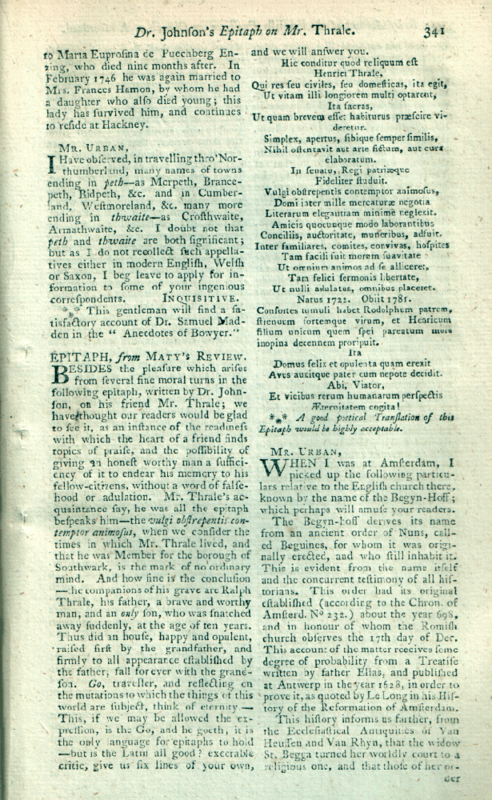 Several epitaphs to Henry Thrale are known to exist, including a mourning tablet written by Samuel Johnson, and written accounts in Thraliana, Gentleman's Magazine, and several testimonials by friends. I am not without my part of the calamity. No death since that of my wife has ever oppressed me like this. … My part of the loss hangs upon me. I have lost a friend of boundless kindness at an age when it is very unlikely that I should find another”;. Johnsons entered a prayer for the family on 22 June 1781, and an unfinished 'meditation' about Thrale's death on 2 September 1781. A more ingenuous frame of mind no man possessed. — Arthur Murphy on Henry Thrale. …a more ingenuous frame of mind no man possessed. His education at Oxford gave him the habits of a gentleman; his amiable temper recommended his conversation, and the goodness of his heart made him a sincere friend. He was a most respectable character; intelligent, modest, communicative and friendly. In his biography of Johnson, James Boswell mentions Henry Thrale's worthy principles, sound scholarship, business acumen, general intelligence and polished manners. He also added his impressive looks, dignified bearing and generosity towards his wife in his allowance to her for entertaining those guests of her own choosing1. A week after Henry's death, Boswell wrote his disrespectful Ode by Dr. Samuel Johnson to Mrs. Thrale upon their Supposed Approaching Nuptials. 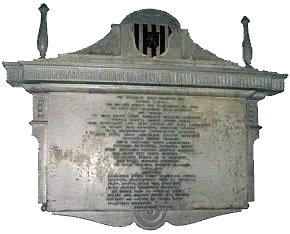 A tablet monument to Henry Thrale was erected on 20 September 1782 in St Leonard’s Church, Streatham, London. The monument is by Joseph Wilton R.A. stage coach carver to the King who made George III's coronation coach. The Latin epitaph one of only three written by Samuel Johnson. The other two being Oliver Goldsmith and Hester Maria Cotton. The epitaph in Latin and English, together with contemporary commentaries is available here. See also our article on Thrale family burial vault.